Over the course of history, many scientists and activists have raised alarm about population numbers that only increase every year. When the English scholar Thomas Malthus published An Essay on the Principle of Population in 1798, the number of people around the world was nearing 1 billion for the first time. “The power of population is indefinitely greater than the power in the earth to produce subsistence for man,” he wrote then. 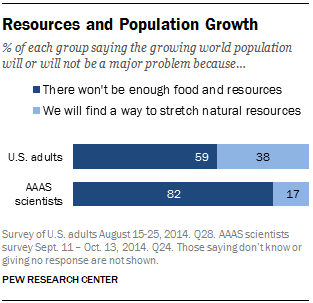 According to a pair of 2014 Pew Research Center surveys, however, today’s scientists are more likely than the general American public to be concerned about population growth, though not necessarily to the extent that Malthus and Ehrlich were. 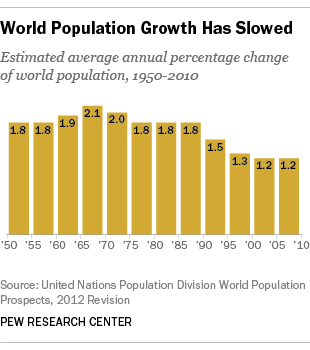 Americans used to be much less concerned about population growth, according to Gallup polls: In 1959, three-quarters (75%) of Americans had heard about the “great increase in population” predicted for the world during the coming decades, but just 21% of Americans said they were worried about it. And when comparing population concerns with a list of global threats, a 1997 Pew Research Center poll showed that Americans were more worried about other potential risks. 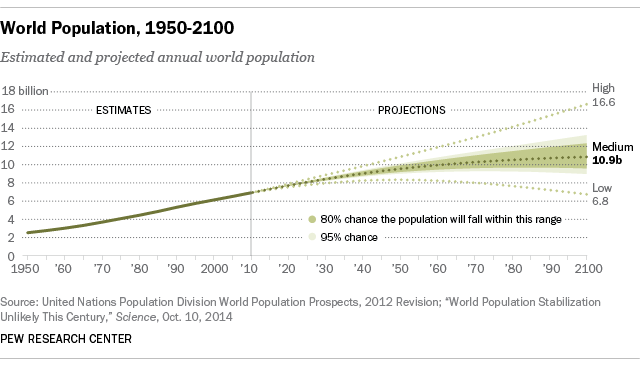 Looking ahead, it’s still unclear what the population trajectory will be. The UN says that population will continue to grow throughout the 21st century, predicting with 80% confidence that it will reach somewhere between 9.6 billion and 12.3 billion people by 2100. Growth is expected to occur mostly in Africa, and abate in the Americas, Europe and parts of Asia, especially as families in more-developed nations have fewer children than they used to have. In many countries in the latter regions, the total fertility rate has dropped below the “replacement rate” of about 2.1 lifetime births per woman. The total fertility rate in the U.S., for example, fell to 1.86 in 2013. This leads to yet another population worry over whether there are enough young people to take care of the older populations, as lifespans continue to increase and fertility decreases in certain parts of the world. Concerns about this issue are more common in Japan, South Korea, China, Germany and Spain, according to our 2013 global survey.